Buy Online Now! 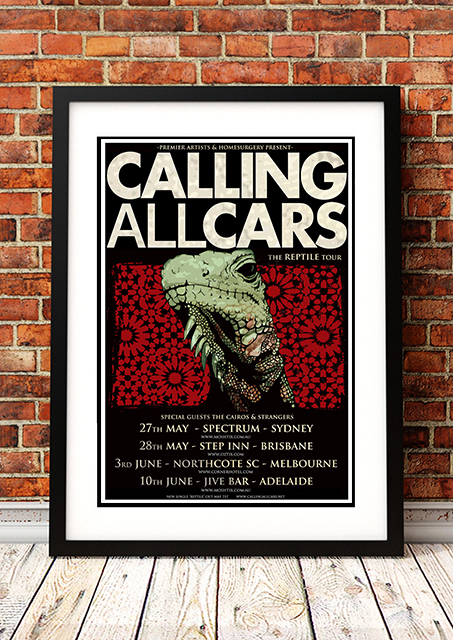 – Classic Calling All Cars Concert Posters and Memorabilia. Calling All Cars formed in 2005 and gradually progressed through live performances with acts like Cog and The Butterfly Effect on national tours. Their first big stadium show was supporting Green Day in Auckland, New Zealand. They have also played many Australian music festivals including the Melbourne Big Day Out in Jan 2010 and were selected to open 11 shows alongside Wolfmother for AC/DC on the Australian leg of their Black Ice World Tour in Feb-March 2010. We stock an some awesome Calling All Cars print.